Russian chess player Sergei Karyakin became grandmaster when he was just 12 years old. 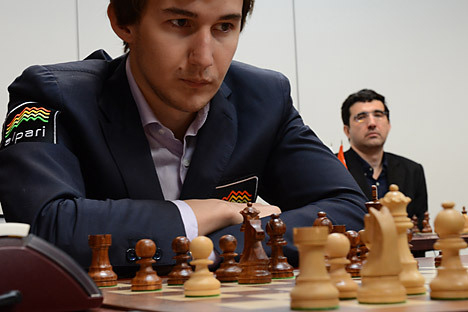 Today the Crimea-born master is 24 years old and is part of the world chess elite. After coming second at a recent tournament, Karyakin is convinced that this is just the beginning. Sergei Karyakin, the 24-year-old Russian chess grandmaster from Simferopol, is reaching the peak of his career. At the recent 2014 Candidates Tournament in Khanty-Mansiysk he won second place, coming behind only former world champion Viswanathan Anand. in order to obtain the world title, the Indian will have to meet with Norwegian Magnus Carlsen in November. As for Karyakin, he can now regard himself as the third best chess player in the world. "I cannot live without chess"
He explains that his chess career began while out for a walk with his mother one day in his home town of Simferopol, in Crimea. At the age of 12 years and 211 days Karyakin became the youngest chess grandmaster in the world. This fact is included in the Guinness Book of Records. Magnus Carlsen, his peer, is the current world champion. He earned the grandmaster title a bit later, but at present he has forged further ahead on his career path than Karyakin. Karyakin’s professional growth slowed down for a while, when he, while still a citizen of Ukraine, was faced with a lack of qualified teachers. Already the winner of the 2009 World Chess Olympiad as a part of the Ukrainian team, Karyakin obtained Russian citizenship and moved to Moscow. Shortly after this event, Karyakin’s marriage with Ukrainian chess player Kateryna Dolzhikova fell apart. Karyakin remains unmarried, but he has a girlfriend named Galya, who he met at one of his tournaments. Galya is responsible for the grandmaster’s personal website and she is also a professional photographer. After moving to Russia, Karyakin’s sports results improved drastically. He won several competitions of the highest category and in 2012 he took the world title in speed chess. Approximately two years ago, Karyakin concluded a long-term sponsorship agreement with forex group Alpari and hired a personal manager. “Even the simplest training camp with accommodation and meals is very expensive. It would be impossible to maintain this lifestyle and work pattern on your prize winnings alone. It is easier for Carlsen – he has a huge number of advertising contracts. The whole of Norway is ready to work for Magnus,” adds Karyakin. "Carlsen and I are friends"
In May of 2013 Karyakin scored a major victory, winning the super tournament in Stavanger, Norway, which included the ten best players of the world. Karyakin beat Carlsen, his main rival and host of the competition, by just half a point. Six months later Carlsen won the World Championship, beating Anand. Despite Karyakin’s many wins in different super tournaments, chess analysts believed that the Russian was not yet ready to compete for the chess crown. But in Khanty-Mansiysk all the skepticism dissolved. Although he started the tournament on a bad note, dropping to second to last place in the ranking, Karyakin managed to win several times in the second round and eventually finished the competition as the runner-up.